Hope everyone enjoyed the long holiday weekend. We had my daughter and son-in-law over for a cookout. After we ate lunch, my daughter, son and I played a super-fun new game that I received to review last week! We opened the box and set up the board - it's BIG! 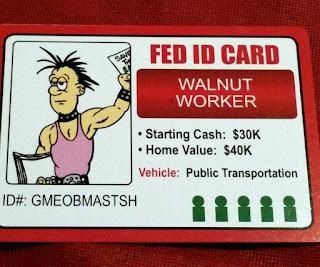 There are several different types of cards and several decks of trivia cards as well. (more about these cards below) We started by reading the instructions and picking our colored pawns for playing. Then David (he was the Game Czar!) chose identity cards for each of us. 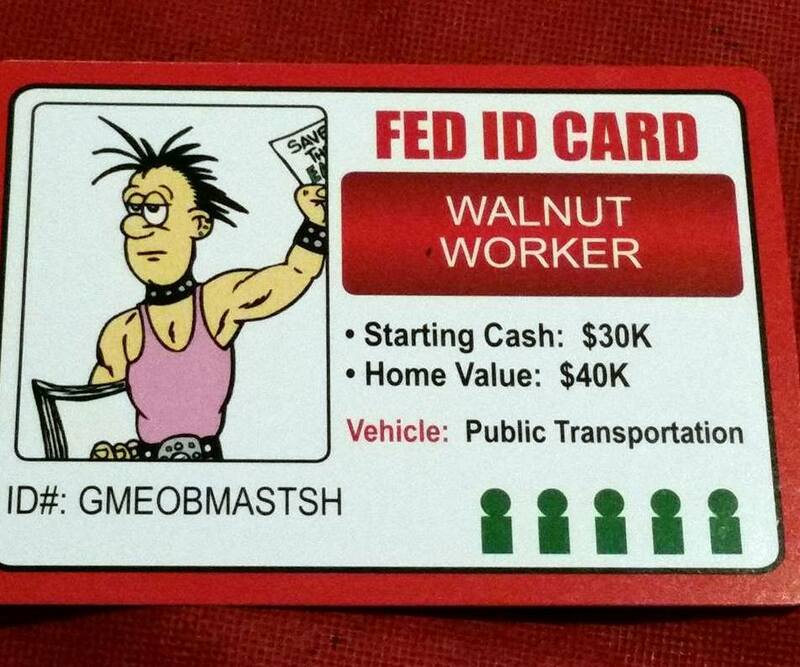 These cards determine each player's occupation, salary, family members and vehicle for the game. I was not too happy with my card - he got me good! We love a good board game and this one didn't disappoint! We laughed a lot during the game, and had a great time playing. I was surprised that I knew a good number of the trivia questions (but not always the ones I got on my turn, ha ha!) I think our game took about an hour to play before Katie was declared the winner. David came in second place and Mom came in last - wahh! We can't wait to play again - it was so much fun and the trivia questions are great! We all learned things while playing this game. Some of the questions we encountered were about religion, historical events and figures, Supreme Court cases, and the Constitution. Oh, and the "Social Justice" cards are hilarious! 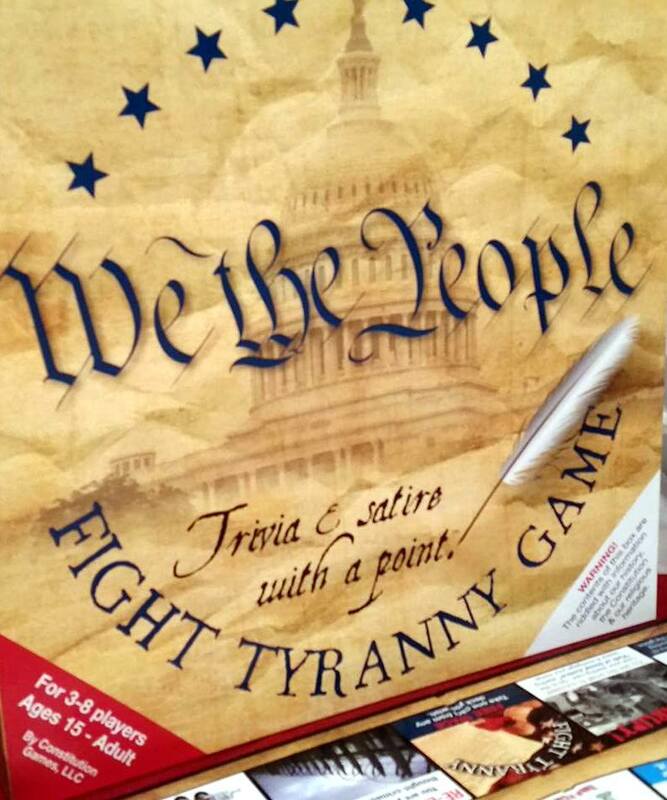 They show you how ridiculous an intrusive government is to our society, and teach players about modern day tyranny. The "Disappoint Big Brother" cards represent ways "We the People" can restore America. 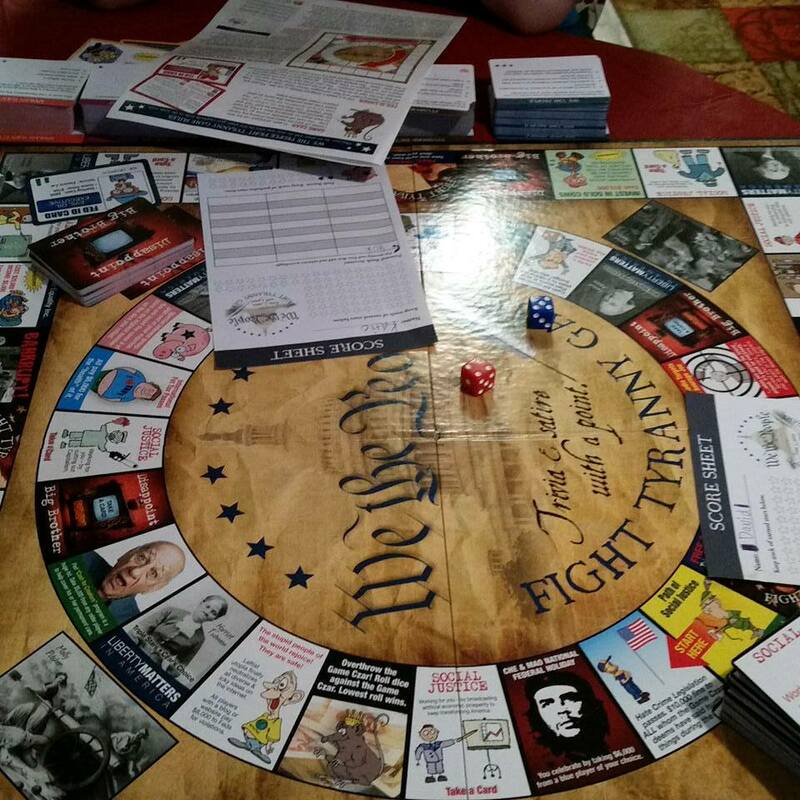 This game WILL spark conversations about our government and changes that are needed! My kids and I already talk about that often, but the game really encourages discussion! 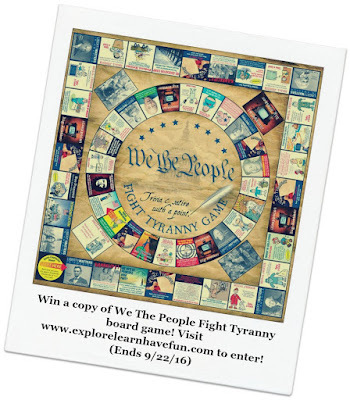 If you homeschool, this makes a great history resource. Heck, even if you DON'T homeschool, it's great! It's meant for 3 - 8 players, and ages 15 and up. David is 12 and he surprised me with how many trivia questions he could answer. So I think some younger kids would do just fine playing this game! 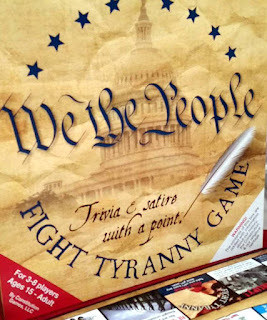 Oh, and another great thing - this game is MADE IN THE USA! Visit the website to learn more about the game, or to purchase your own copy! I am so excited that the game designers are sponsoring a giveaway of We The People Fight Tyranny. This giveaway has a retail value of $56.99 but they are going to send one of my readers a FREE game! Isn't that awesome? All you have to do is enter through my rafflecopter widget below. Make sure you complete the mandatory entries (one of which includes leaving a comment below this post) so your bonus entries will count! Good luck and thanks for stopping by! Disclaimer: I received a copy of the game to facilitate my review. No other compensation was received. Sponsor will provide and mail the game to my winner. (US residents only). We always look forward to having a family game night on the weekends and I know my family would really enjoy playing this game together!! The game looks both fun and educational!! Thanks for the chance. And thank you for bringing to my attention this game. I would love to play it with my family and it really looks like something we would enjoy. Thanks for the chance of winning it and have a really great day. My mother is a huge history buff so I know she would love this game. Thanks for the chance to win. Even adults would LOVE this game. I know hubby and his old cronies and the younger crowd would have a ball with it. I would play this with my husband and kids. Next game night I would play this with my friends. 2 other couples come over once a month. While the kids are in the family room playing we play board games in the kitchen. It is always a ton of fun and we are always looking for new games. I think this will be a big hit! Looks like a fun game! I would love this game! I would play it with my kids and husband. We enjoy all kinds of board games and card games but I've never seen this one before.